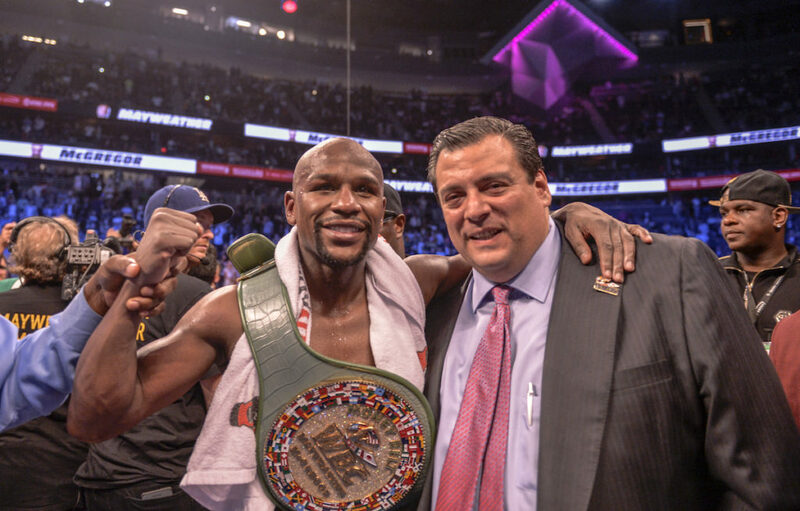 Mayweather Promotions Celebrates 10 Years of Success with Record-Breaking Events, Sell-out Shows, and More! Mayweather Promotions Celebrates 10 Years of Success with Record-Breaking Events, Sell-out Shows, and a Fresh Stable of New Talent Topped by Former Olympians, & Rising Prospects Closing 2017 with a Bang! LAS VEGAS (January 5, 2018) Mayweather Promotions, formed by President, Floyd Mayweather and spearheaded by, CEO, Leonard Ellerbe has flourished over the last decade, as the leading promotional company in sports & entertainment. This past year saw Mayweather Promotions at the forefront of boxing, from producing some of the most successful shows in 2017, to grooming their stable of talent by signing on praised prospects, and former Olympians. The company has brilliantly carried over the success of 12-time undefeated world champion, Floyd “Money” Mayweather, into a full service promotional company. In 2017, Mayweather Promotions produced unprecedented record-breaking events for fans worldwide, promoted their first show ever in London, England, saw some world title championships brought home, put on several sell-out shows, and looks to carry the momentum in to 2018! From the beginning of the last year, Mayweather Promotions promoted a number of widely distributed shows, beginning with two-time world champion, Badou Jack vs. James DeGale in a Super Middleweight unification bout in Brooklyn, NY, at Barclays Center on January 14th. The championship bout was deemed as the event to “Bring Boxing back to New York”, and was co-promoted by DiBella Entertainment. The card set the bar for what fight fans could expect from Mayweather Promotions for the remainder of the year, and foreshadowed the success and excitement Mayweather Promotions would later unleash in 2017 with their fight cards. The card was filled top to bottom with non-stop gritty action featuring top prospects that battled top contenders in their respective divisions. Despite the judges scoring the main event fight a controversial draw between Jack and DeGale, it was a card that wrote history for one Mayweather Promotions fighter. Gervonta Davis became the youngest current American world champion. Davis delivered a spectacular 7th round TKO victory, upsetting former IBF World Champion Jose Pedraza that stunned boxing fans worldwide. The following month, on February 24th Mayweather Promotions produced their first show in Southern California at Pechanga Resort & Casino. Mayweather Promotions’ Chris Pearson vs. rising prospect Justin DeLoach headlined the card, ending in a successful win for rising prospect Justin DeLoach. The televised card also featured newly signed top Lightweight prospect Neno Rodriguez, who gained his first win since signing with Mayweather Promotions, by unanimous decision. and undefeated contender Andrew Tabiti (15-0, 12 KO’s) who successfully defended his NABF Cruiserweight title against Quantis Graves. The fight was witnessed ringside by The Champ, Floyd Mayweather, who celebrated his 40th birthday; in true Money May fashion with an elaborate schedule of events hosted in Los Angeles, CA for the weekend. With no signs of slowing down, Mayweather Promotions promoted their first attraction in London, England on May 20, 2017, at Copper Box Arena with Frank Warren Promotions. Newly-crowned champion Gervonta Davis made his first title defense when he took on undefeated challenger Liam Walsh, in Walsh’s backyard. Davis defended his title with a TKO victory in the 3rd round and successfully brought his belt back safely to the states. Showtime presented a summer blockbuster event headlined by two of boxing’s biggest stars, former four-division world champion, Adrien Broner vs. three-division world champion, Mikey Garcia. The bout was co-promoted by Mayweather Promotions, along with About Billions, and DiBella Entertainment, and included a stacked card of strong and powerful undefeated fighters. It was one of boxing’s most talked-about matchups of the year. On July 29th fight fans were granted their wish, when Broner and Garcia came face to face inside of Barclays, which ended in Garcia outpointing Broner after 12-rounds of action. The card also featured co-main event action from former world champion Jermall Charlo who KO’d Jorge Sebastian after 4-rounds of brutal defeat. July & August proved to be by far the most exciting and prosperous months for Mayweather Promotions, as undefeated boxing legend, Floyd “Money” Mayweather, came out of retirement to fight in an unprecedented matchup against “The Notorious” Conor McGregor, a fight no one thought was possible. Before the biggest event in sports history took place between Mayweather and McGregor, it was the 4-city world tour that gained interest and picked up traction. The tour displayed some of the most controversial acts ever seen, by two of the best self-promoting figures in sports. The tour hit 4 major cities in four days to promote the mega-event and saw 50,000 fans worldwide. Between July 11th-14th, the world tour made stops in Los Angeles, CA at Staples Center, Toronto, Canada’s Budweiser Stage, Brooklyn, New York at Barclays Center, and ended in London, England at SSE Wembley. The Showtime PPV presentation of Mayweather vs. McGregor on August 26, 2017 generated the second most pay-per-view buys in North America with an astonishing number of 4.3 million. The total global revenue from this PPV attraction, that includes ticket sales, sponsorship, and international distribution, exceeds $600 million, which contributes to the largest revenue for a single-day sporting event that history has ever seen. This bout has officially become Showtime PPV’s second best event of all time. Mayweather and Showtime PPV are now comprised of the three -highest grossing pay-per-view events in television history. Mayweather vs. McGregor undeniably became the biggest fight in combat sports history with record-breaking numbers, but this won’t be the last time we make history. Mayweather Promotions continues to build a powerful roster of fighters who will soon be put to the test to create their own legacy in becoming world champions. We look forward to a prosperous 2018 as we plan to produce many more record-breaking events, and championship bouts. Mayweather Promotions’ list of new talent in 2017 includes: Former Olympians Richardson Hitchins, Dylan Price, and Savannah Marshall, along with rising prospects Neno Rodriguez, Cameron Krael, Angelo Leo, former IFBA, IBF, 3x WBC Boxing Champion Ava Knight, and accomplished former world champion Layla McCarter.